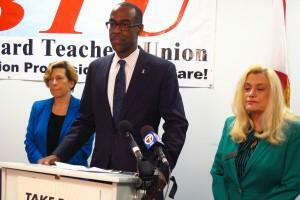 Broward schools Superintendent Robert Runcie with American Federation of Teachers President Randi Weingarten, left, and Broward Teachers Union President Sharon Glickman, right. 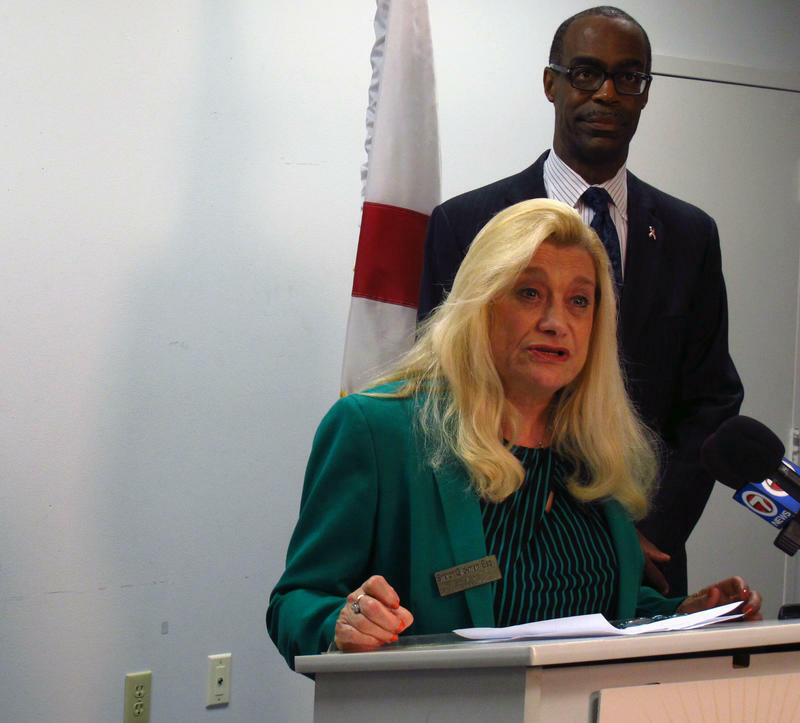 The superintendents of Florida's two largest school districts say it is less likely they'll make students repeat third grade next year because of low state reading test scores. State law requires that students earning the lowest score on the reading exam have to repeat third grade unless they are granted an exemption. About 16,000 students across the state were held back last year. But Florida has switched to a new statewide test this year, the Florida Standards Assessments, and educators aren't sure they can trust the results. "I think teachers and principals will err on the side of caution and will want to do no harm to students,” said Miami-Dade schools Superintendent Alberto Carvalho, who believes this year's test results should have no consequences. The state has hired an outside firm to make sure the test is valid. But the means results won't be back until after the new school year has started -- long after schools have decided which students should move on or not. So lawmakers approved a law which gives school districts more say over the decision -- for this year only. School superintendents say they’ll hold back fewer third grade students for low test scores this year. “I believe we will have fewer students retained,” said Broward County schools Superintendent Robert Runcie. Runcie said teachers don't need the results of the state test to know which students need more help. The students who need more reading help will get it, he said. About one in five third grade students earn the lowest score on the state reading test most years. And about one in 14 third graders actually has to repeat third grade because they don’t receive an exemption. The law has been in place since 2003. Students can receive an exemption if they earn a passing score on another reading exam, complete a portfolio or a handful of other options. Florida lawmakers’ decision to end mandatory final exams for every class will mean that more teachers’ performance will be judged on subjects they don’t teach. Concerned about the amount of testing in schools -- and pressured by activists and educators -- this year lawmakers rescinded a state law that requires school districts to have a standard final assessment in any class that doesn’t already have a statewide exam. In most cases that’s a test, but it could be a final project or compilation of a student’s work. Miami Northwestern High School English teacher Daniel Dickey has found a way to make his tenth graders brag about their reading skills. Mischael Saint-Sume and Ciji Wright tease each other about who's going to read one million words first -- a contest Dickey created. “Did you put him in his place?" Dickey asked Wright. "Because Mischael, he’s popping in my classroom every day with a new book." “Oh don’t worry about it because I’ve got plenty of books for him,” Wright replied. We're taking this week to help parents and students understand the new Florida Standards Assessments, which students will take for the first time beginning in March.